prepair™ by the Victorian Clinical Genetics Services (VCGS) is a genetic carrier screen offered to individuals and couples who are considering or are in early pregnancy. Carrier screening for CF, FXS and SMA may be offered to all women*. prepair™ identifies whether an individual is a carrier of cystic fibrosis (CF), fragile X syndrome (FXS) or spinal muscular atrophy (SMA). Being a carrier puts an individual at increased chance of having a child with that condition. Many people are carriers of CF, FXS or SMA even though no one in their family has the condition. * Including those with a family history and those considered low risk (i.e. no family history & regardless of ethnicity). Reference: RANZCOG/HGSA joint committee on Prenatal Diagnosis and Screeening C-Obs 59.
prepair™ carrier screening is a genetic test that can determine if an individual or couple are at increased chance of having a baby with CF, FXS or SMA. These three genetic conditions have serious health consequences and are some of the most common inherited conditions in the general population. prepair™ is a simple test that can be performed on a blood or saliva* sample. prepair™ can be performed before pregnancy or in early pregnancy (prior to 12 weeks). Having the test before you are pregnant means there is time to consider your options if you find out you are a carrier of CF, FXS or SMA. CF, FXS and SMA have been included in the prepair™ carrier screening test because of the high number of carriers in the general population, the severity of the conditions and the availability of accurate testing. Cystic fibrosis (CF): is an inherited condition that primarily affects the lungs and digestive system. Individuals with CF develop an abnormal amount of thick mucus within the lungs and gut. In the lungs, this mucus traps bacteria resulting in recurrent infections. Within the gut, the mucus impairs digestion of food. Infants, children and adults with CF require daily chest physiotherapy to clear the mucus from the lungs and enzyme replacement medication to aid in food digestion. CF is a serious condition and there is no cure. Individuals with CF have a shortened life span with lung failure being the major cause of death. Fragile X syndrome (FXS): is the most common cause of inherited intellectual disability. People with FXS can have developmental delay, learning difficulties, anxiety, autism, epilepsy as well as some physical characteristics. The features of FXS vary from mild to severe but because FXS is located on the X-chromosome, males are more likely to be severely affected than females. There is no cure for FXS although some educational, behavioural and medical interventions can improve outcomes for people with FXS. Some females who are carriers for FXS may develop fertility problems and go through menopause early (less than the age of 40). Spinal muscular atrophy (SMA): is a condition that affects nerves in the spinal cord and causes muscles to get weaker. There are four types of SMA, with SMA type 1 being the most common and the most severe. prepair™ only looks for genetic causes of SMA type 1. Babies with SMA type 1 have weak muscles from birth and usually do not live past two years of age. There is no cure for SMA, however there are treatments and interventions available aimed at managing symptoms and improving quality of life. Before having prepair™, we recommend speaking with your doctor to ensure you understand the information that this test provides. VCGS also offers pre- and post-test genetic counselling support services for all patients wishing to access prepair™ which can be arranged through our genetic carrier screening specialists: (03) 9936 6402. To access prepair™ you require a signed request form from your doctor or genetic counsellor. It is recommended that the biological mother (or prospective biological mother) is screened first as fragile X syndrome is only inherited from the biological mother. The biological father will only require testing if the mother is found to be a carrier of CF or SMA. prepair™ requires a blood sample - approved collection centres are listed below. No special preparation is required before this test. No collection centre near you (Australia or New Zealand)? Well prepair™ can also be performed using a saliva sample. Order your saliva sampling kit at vcgs.org.au/order. Or email us for more information: [email protected]. Blood collection for prepair carrier screening is available at all Mater Pathology collection centres. What is a recessive genetic condition? We each inherit two copies of every gene from our parents, one copy from our mother and one copy from our father. Our genes often have changes (also known as mutations or variants) and in most cases, these do not cause health problems. For recessive genetic conditions, people who have a variant in only one copy of a gene are called 'carriers' and in most instances do not have health problems. Health problems only occur when both copies of that gene have a variant. A couple who are both carriers of the same condition, have a 1 in 4 (25%) chance of having a child who will develop that condition. Half of their children (2 in 4) will also be carriers of that condition and will themselves be at increased risk of having a child with that condition. 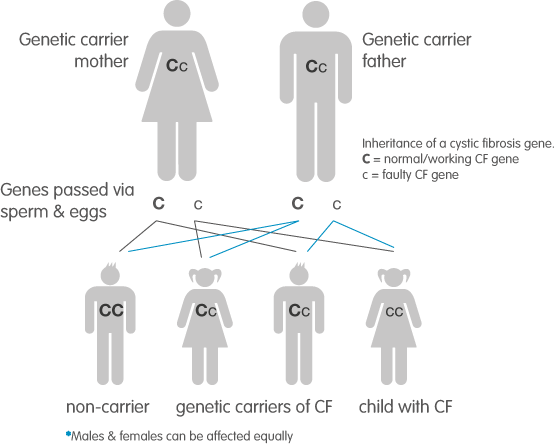 Cystic fibrosis is an example of a recessive genetic condition. What if prepair™ shows I’m a carrier? If you are found to be a carrier of CF, FXS or SMA, one of our genetic counsellors will contact your doctor to discuss the result, and further testing options. If you are a carrier of CF and SMA, we recommend your partner consider testing. If you and your partner are carriers of the same condition, there is a 1 in 4 (25%) chance of having a child with that condition. Women who are carriers of FXS* have a 1 in 2 (50%) chance of passing the gene change to their children. FXS has a different inheritance pattern to CF or SMA because the gene is found on the X chromosome. A child inheriting the FXS gene change may either be a carrier like their mother, or may be affected by fragile X syndrome. For more information about being a carrier of CF, SMA or FXS, see our fact sheets. Note: There is no out-of-pocket cost for partners of individuals identified to be an SMA carrier via prepair. Do I need carrier screening every time I get pregnant? No. Once your carrier status is known, you do not need to be re-tested. If you are a carrier of one of these conditions and you have a new partner, the partner may need to be tested. How accurate is prepair™ reproductive carrier screening? prepair™ will identify 90% of CF carriers; 99% of FXS carriers and 95% of SMA carriers. There are rare and even unknown mutations/variants that can cause these conditions, and they will not be identified with this test. I wish to speak to a genetic counsellor about prepair™. How much does prepair™ cost? There is no Medicare rebate for prepair™ carrier screening and there will be an out of pocket cost of $385 (for Australian patients). Please contact us if you wish to access this test from outside Australia: Phone +61 3 9936 6402.
prepair™ results will be faxed and delivered electronically (where available) to your referring doctor within 10 working days. After testing is complete, patients will receive an invoice. This can be paid by phone using BPAY or credit card, or by mail using a money order or cheque. Payment methods are detailed on the invoice.